The many health and wellness benefits of physical activity are proven. As we age, we want to be as healthy, active and independent as possible. Those who remain physically active as they age are typically rewarded with increased vitality and improved cognitive function. Although many people accept the loss of flexibility and mobility as a natural result of the ageing process, that muscle weakness, stiffness, and pain are simply part of the experience; it doesn't have to be that way. Physiotherapy for the elderly can help seniors regain their strength, improve their flexibility, and stall or prevent cognitive decline. When a stroke damages the part of the brain that controls movement, those living with the after-effects may experience weakness or paralysis (hemiplegia). After a stroke, recovery is dependent on the brain's ability to reorganise undamaged cells to compensate for damaged areas. This ability to restructure is called neuroplasticity. A physiotherapist can help those living with the effects of a stroke by helping the brain relearn movement patterns. Early intervention by a skilled physiotherapist can help prevent further complications while restoring mobility. Balance is the result of postural control. There is a wide range of functions involved in maintaining an upright position. Even slight imbalances in movement and posture can have devastating consequences. An older person may fall into situations that a younger person would not. Muscle strength, balance, and coordinated muscle movements are necessary to counter fall risks. By improving muscle strength, coordination and posture, physiotherapy can help reduce the risk of falls, which reduces the risk of injury and serious health complications including hip fractures. There have been numerous studies that support the many potential benefits of physical activity and exercise for those living with the effects of Alzheimer's disease and other forms of dementia. Flexibility, balance and strength exercises play a significant role in symptom management. A physiotherapist can tailor exercises in their physiotherapy sessions to meet the needs of the individual. Exercise enhances cognitive abilities by providing physical and mental stimulation and supporting nerve cell growth. Physiotherapy also offers an additional opportunity to socialise, helps alleviate the symptoms of depression, and improves sleep. Bowel or bladder incontinence is not considered a natural result of the ageing process. Incontinence is typically caused by pelvic floor dysfunction, the muscles of the pelvic floor become weak or tight. While some seniors develop pelvic floor disorders from illness or injury, pelvic floor disorders are sometimes the result of stress, clenching muscles rather than allowing the muscles of the pelvic floor to relax. A physiotherapist can help seniors relearn to control pelvic floor muscles through internal or external soft tissue mobilisation, muscle re-education, or a number of other effective treatment options. After an injury, physiotherapy can help strengthen damaged muscles and protect damaged joints. Most find that physiotherapy eases their discomfort and speeds the healing processes. An injury is not the only common cause of pain and inflammation for the elderly. Many seniors live with potentially debilitating pain caused by osteoarthritis, nerve damage, or other painful health conditions. While medications can help relieve pain and inflammation, not everyone responds favourably to medication alone. When living with a chronic health condition that causes pain, it's often hard to imagine that moving and strengthening painful areas could ease the discomfort, but it does. A physiotherapist will devise a plan to strengthen the affected muscles and joints without causing additional stress and strain. Manual pressure and massage decreases muscle tension and helps release the fibres that encase painful muscles, the fascia. Deep tissue massage and myofascial release are shown to increase flexibility, promote muscle relaxation, improve circulation and alleviate joint stiffness. Many people also find that massage reduces anxiety and improves sleep. Improving sleep quality helps the body heal and repair. The application of heat is often recommended to relax muscles and improve circulation. Heat alleviates pain as it helps inflamed tissues heal. The type of heat your physiotherapist recommends will depend on the reason treatments. A physiotherapist may recommend moist heat, dry heat, or hydrotherapy. A physiotherapist may suggest using strategically placed electrode pads to deliver electrical impulses to irritated nerve pathways. This type of nerve therapy is called transcutaneous electrical nerve stimulation (TENS). Nerve stimulation reduces the number of pain signals that reach the brain and promotes muscle relaxation. TENS treatment is not painful; you may notice a slight vibrating sensation at the point of contact. Most find TENS therapy quite relaxing. Ultrasound therapy uses focused sound waves to generate heat. The deep penetrating heat of ultrasound therapy reduces inflammation, improves circulation, alleviates muscle spasms, and reduces stiffness. This non-invasive treatment method has been used successfully for years to minimise pain and promote healing. The ancient practice of acupuncture is shown to provide relief from arthritis, migraine pain, and injury. While this practice does involve the use of fine needles on the skin, most find the inconsequential sensation similar to the bite of a mosquito. Acupuncture assists in the body's natural healing abilities and promotes circulation. 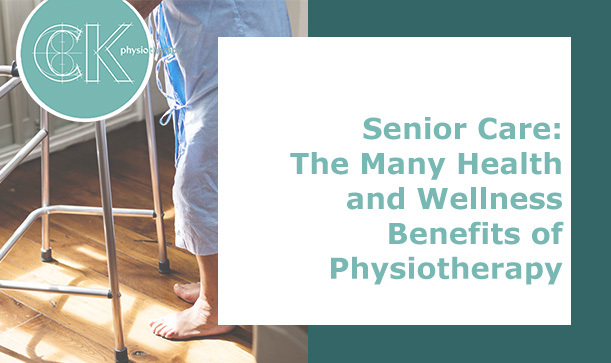 While a physiotherapist can help seniors recover from illness or injury, and minimise pain, many health issues can be prevented, managed, or treated by a skilled physiotherapist. A physiotherapist can help decrease your risk of injury by helping increase your muscle tone, core strength, and balance. Seniors with limited mobility, heart disease, or other common health concerns may need assistance in learning how to exercise safely. Physiotherapy provides education and instruction, helps seniors identify the best types of exercise for their physical condition, and helps them learn to perform exercises correctly. A well-rounded fitness program includes strength, flexibility, balance, and aerobic training. A skilled physiotherapist can instruct seniors to perform exercises safely and reduce the risk of injury caused by incorrectly performed exercises. A physiotherapist can also adapt individual exercises to the needs or physical limitations of the individual. Physiotherapy can help seniors recover from illness or injury, reduce their risk of falls, and provide patient education. Like anything worthwhile, physical therapy is often a journey, an ongoing process. For a customised rehabilitation or fitness program in London, Ealing, and Hanwell, contact CK Physiotherapy. We treat the injuries and diseases affecting our senior population by stimulating the body's natural ability to heal.